Sometimes, Japan's bold food experiments leave us jealous and hungry. But most of the time, they just confuse us. 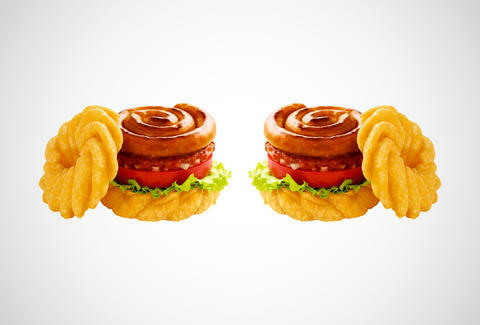 This is one of those times, as the Japanese chain Mos Burger has dropped a limited-run French Cruller Burger with a donut bun and a hypnotic spiral chorizo-sausage patty. The French Cruller Burger is the star of Mos Burger's cross-over campaign with Mister Donut, a partnership that's also produced a Grilled Beef Rice Burger and a Red Bean & Custard Rice Burger, each featuring rice patty buns, plus a Chocolate Berry French Cruller dessert burger that mercifully skips any meat for a bunch of fruit sauces and whipped cream. While that dessert burger does sound kinda tasty, we'll stick with this guy for our foreseeable donut burger needs. Kristin Hunt is a food/drink staff writer for Thrillist, and wonders if Mister Donut is a disappointment to his Dad, Doctor Donut. Follow her at @kristin_hunt.